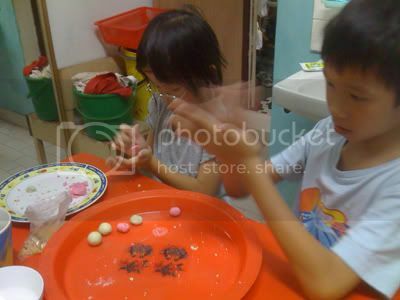 I remembered when I was young I helped my mom make tang yuen (glutinous rice flour ball). We eat this to during Winter Solstice Festival (Dong Zhi). Well, after I got married, I don’t get to eat it because I am lazy to make it. Maybe I should try to make this next year. Since I was in KL, my kind aunt invited my family to celebrate Dong Zhi. She cooked my favorite asam boi. Tim was walloping the steam fish. He loved it, more like drinking the fish soya sauce. At the end of the meal, my cousins started making tang yuen. My children joined in the fun. They are good at it after the practice with my home made play doh. I must say that the Tang Yuen tasted extra delicious because it was specially made by my children. I can tell which ones were made by them too. That is by the size of the sugar in them. They like to pick the big size sugar. Actually I like the ones with peanut filling, some used peanut butter. I wonder is there any more glutinous rice flour dough in the market. I also got my girls to make them this year.. save me lots of work, and help with the younger’s motor skill.